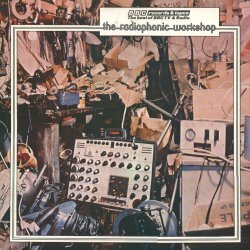 Title: The Radiophonic Workshop This album was remastered by Mark Ayers and released on CD in 2002. The CD offered two new tracks, Accentric and Chino, both by John Baker. The BBC Radiophonic Workshop provides a creative service, ranging from complete background scores of electronic music for radio and television productions, through sound for poetry and science fiction to signature tunes; periodically, complete experimental stereo programmes are originated and produced. Apart from the electronic music for 'Dr. Who', the Radiophonic Workshop makes major contributions to television drama, documentaries and children's programmes; to drama and schools programmes on radio, and to many local radio stations. In all, more than two hundred different commitments a year are undertaken. The composition and realisation of the music and sound is done by a small number of specialised creative staff. "On visiting the Radiophonic Workshop, many people are surprised to find that there are, in fact, four 'Workshops' where electronic music of various kinds is produced. The 'Workshops' are equipped with a good deal of conventional professional audio equipment, together with many devices, which have been modified or specially constructed for use in the realisation of electronic music. The heart of the operation, however, is always the person who composes the music, and eventually translates his or her ideas onto a piece of recording tape (Realisation). Most people working in this field prefer to work alone, or with a minimum of technical assistance, but we have included two pieces on this record where collaborations have taken place: 'La Grande Piece' composed by Malcolm Clarke and realised with assistance from Richard Yeoman-Clark and 'Nenuphar' composed and realised by Malcolm Clarke and Glynis Jones. In making the record, we have set out to entertain rather than inform, but we hope it gives some idea of the range of music produced by the Radiophonic workshop. is the workshop's 'oldest inhabitant' since 1958. His earliest claim to fame was 'Major Bloodnok's Stomach', however, he is now better known for the electronic sounds in 'Dr. Who'. As a total contrast to his work, he is an enthusiastic aquarist - the quietest of hobbies. came to the Workshop two years ago, a musician by instinct and training, "But now I find artistic vagrancy a more exciting way of life. So many unnecessary fences have been erected around expressive media. I've scrambled painfully through a few of them, and have been amused at how far I can see from the other side." joined the Radiophonic Workshop in 1963, and has evolved an unique style of electronic music composition, using familiar basic sounds combined with sophisticated tape-recording techniques. He studied composition at The Royal Academy of Music and is an accomplished jazz musician and arranger. joined the Radiophonic Workshop in 1970, and has composed signature tunes for many Radio and Television shows, also, radiophonic music for drama, poetry and documentary programmes. He prefers to use a mixture of electronic and conventional instrumental sounds in his work rather than pure electronics. This is demonstrated on his BBC Records LP 'Fourth Dimension'. started his musical career as a chorister in St. Albans Abbey. He came to the Workshop in 1970, having been involved in the early BBC stereo experiments, and several live electronic music broadcasts. His considerable knowledge of electronics has proved invaluable not only in realising his own compositions but also in advising other members of the Workshop. finds, in the creation of radiophonic sound, the satisfaction of working as an individual in a complete art form. He is now working towards combining electronic sound and visual images to form a self-contained medium in which the artist has total control over the work at every stage. originally from Cheltenham, joined the BBC as a studio manager, and came to the Workshop after working as a television announcer. He has a formal musical background but finds his years playing in jazz and pop groups equally as valuable in his Radiophonic work.